Macdonnell, Mrs. Logie. 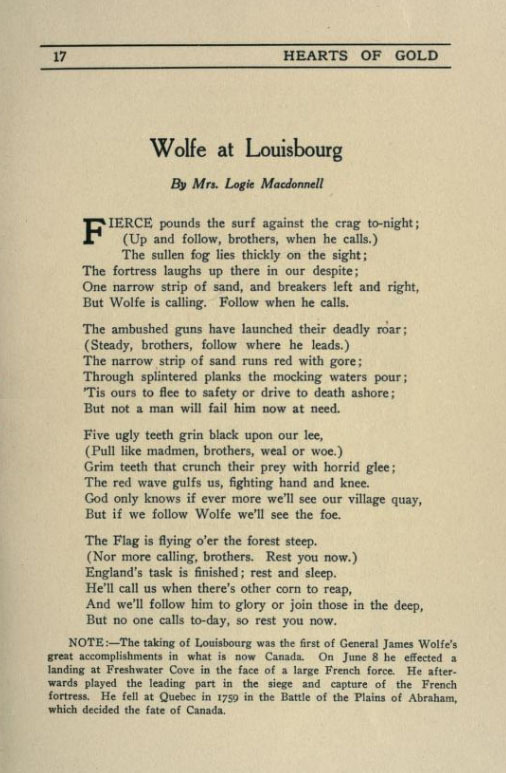 “Wolfe at Louisburg.” Hearts of Gold: Being Chronicles of Heroism in Canadian History. Ed. Jean Blewett (Toronto: Ontario Women’s Liberal Association, 1915): 17. I was looking for information about one of our authors, Blanche Lucile Macdonnell (c1847-1924), and came across this poem in Hearts of Gold, edited by another of our authors, Jean Blewett. The full text is available online courtesy of the Internet Archive, but I thought I would post this poem here to see if anyone knows the identity of Mrs. Logie Macdonnell. Blanche Macdonnell, it turns out, never married.